Cutter Backwoods Insect Repellent provides up to 10 hours of protection from mosquitoes, ticks, chiggers, gnats, no-see-ums, fleas and biting flies. Kills and repels over 100 insects. Works fast kills on contact. Safe to use around children and pets. Non toxic, plant based formula. Great for lawns and landscapes. Treats up to 5,000 square feet. Supported with national advertising. Makes 12 gal. and covers up to 3200 sq. ft. Safer Brand 32 oz. 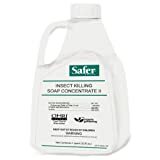 Insect Killing Soap Concentrate makes 12 gal. of OMRI listed insecticidal soap to eliminate soft bodied insects on contact. One bottle (when mixed) covers up to 3,200 sq. ft., making it ideal for professional growers and hydroponic gardeners who treat large areas. This concentrate targets and kills soft bodied insects such as aphids, mites, earwigs, and more. Safer Brand Insecticidal Soap breaks down into its natural state within 7-10 days, and does not persist in the environment.